What does endoluminal repair of the aneurysm involve? As your vascular surgeon has explained to you, the main artery in your abdomen, the abdominal aorta, has a weak and swollen area (abdominal aortic aneurysm). In order to prevent bursting (rupture) of the aneurysm, you need to have an operation for replacement of this part of the aorta with a graft. 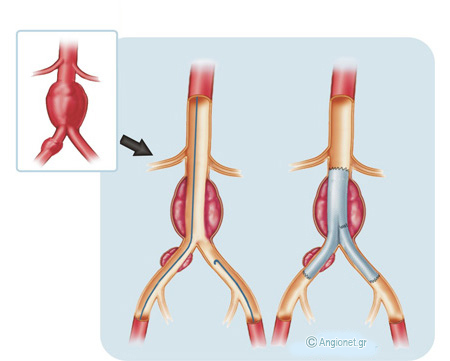 The anatomical features (shape, extent, relation to the renal arteries etc) of your aneurysm are favourable for endovascular repair (EVAR) with replacement of the aorta with a stented graft. This newer method was selected in your case as a better option (over open surgical repair), usually on grounds of your age and medical history. This procedure involves injecting a liquid, the “contrast”, which makes the blood flowing inside the blood vessels visible on an x-ray. The contrast is later eliminated from your body through your kidneys and your urine. Your physician will generally require that at least 4 units of blood are available for you. In Greece, you need to personally liaise with the Blood Bank of your hospital in order that blood is secured for you. The physician will have probably asked you to discontinue for a few days (if you take) any anticoagulant, like Warfarin or Sintrom, or antiplatelet drugs like Clopidogrel (Iscover, Plavix) or Aspirin, in order to reduce the risk for bleeding. When you are admitted, it will be quite useful to bring with you all medications you are on. Your medical history will be recorded. Later, your vascular surgeon and the anaesthetist who will put you to sleep will visit. They will explain certain aspects of the procedure and of the immediate postoperative care. You will be asked to sign a form confirming that you understand why the procedure needs to be performed, the risks of the procedure and that you agree to the surgery. The first part of any operation is the administration of anaesthesia. Initially, your anaesthetist will probably insert an epidural catheter in your back to provide pain relief during and after the operation. Through an IV in your arm, used to provide you with fluids and medications, you will receive the anaesthetic which will put you to sleep within a few seconds. Then, a “central” venous catheter may be inserted in a large vein in your neck to give you the fluids required during and after the operation, and an “arterial line” may be used for continuous monitoring of your blood pressure. A urinary catheter will be placed in your bladder in order to prevent filling of the bladder with urine containing contrast (which would hinter imaging) and to monitor your urine output. Endovascular or endoluminal means that the procedure is done through the wall of your arteries inside their lumen using very fine and long tubes, called catheters. Initially, a small incision is made in each groin area, where the arteries are punctured with a hollow needle. A thin wire is advanced through the needle, and then the angiographic catheter is passed over the wire and guided to the desired location. Your team of physicians use x-rays that are projected on a video screen, a process called fluoroscopy, to see the wires and catheters as they move through your arteries. The catheters are gradually exchanged to larger ones and finally a tube (typically made of a polyester or PTFE graft with a stent exoskeleton), called stented graft or endograft, will be guided to the site of the aneurysm. Like the graft in open repair the endograft reinforces the aorta. After confirmation that it is in the right position, all catheters will be removed and the wounds closed. Following the operation you may need to stay for a while in the High Dependency Unit before coming back to your room. It is unlikely that you be transferred to the Intensive Care Unit for closer observation (where you will usually stay for less than 24 hours). Next day, you should be able to eat lightly and walk. Your recovery time after EVAR is shorter than with the open repair and hospital stay may be reduced to 2-3 days. You will often feel tired but this will improve as time goes by. Following endovascular stent grafting for an abdominal aortic aneurysm, it is estimated that up to 10% of patients per year may require a corrective procedure, which is usually feasible with an endovascular technique again. - Other rare, but serious, complications may be either early, like artery rupture, kidney failure, mesenteric ischaemia (reduction of blood flow to the bowels) and paraplegia, or late, like infection of the endograft and late rupture of the aneurysm. With the current data, it is estimated that the risk for aneurysm rupture 7 years after an EVAR is probably over 10% if regular periodic imaging has not been done and if any corrective procedure required has not performed. Attend for follow-up CT scanning of the abdominal aorta & iliac arteries as your vascular surgeon has instructed you.